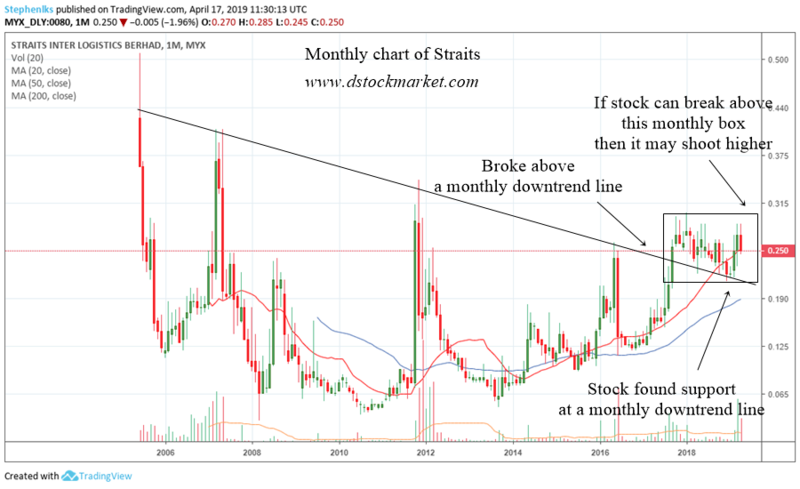 Technical analysis of Straits stock price. A look at the price action, support and resistance etc of Straits Inter Logistics. I normally do not like to analyze penny stocks. Their trend is less defined. Sometimes they can shoot up and down so fast. In addition to that, there is a lack of liquidity and the daily chart is just so hard to analyze. Therefore, I would advise people to avoid penny stocks. Try to stick with stocks that have more liquidity. Even if the penny stocks trade in the millions...well...the money value is just so small that you can't avoid manipulation at times. Try to choose stocks that are in an uptrend as well. You won't be going far with stocks that are just trading sideways for a long time. I won't be looking at the daily chart. I just find it too difficult to analyze. Instead I will look at the bigger picture from a weekly chart point of view. 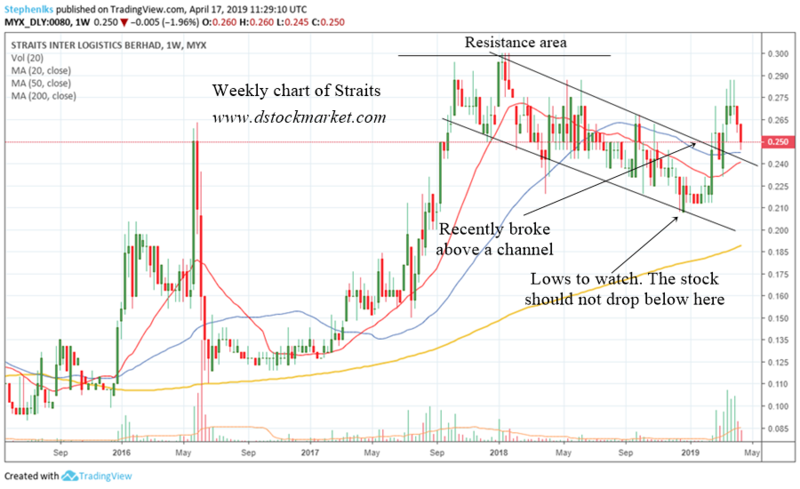 Straits recently shot up as it broke above a weekly channel or downtrend line. The movement is not as nice compared to in 2017 where it had a nice uptrend. For most of 2018 it was just drifting lower. The area you should take note is the lows of the channel. If this stock is any good it should not go lower below that area. Next let's take a look at the monthly chart of this stock. The stock broke above a monthly downtrend line. While it does not mean it will shoot up immediately, I always take into consideration the fact that a stock has broken above a trend line. It was able to find support at the downtrend line. Let's just draw a box for the recent price action. If the stock can break above this box then long term, it can go up more. On the other hand if the stock breaks below the box, then it will continue to go lower and trade in the miserable sideways it has done for a long time. Try not to waste your time on stocks that are not trending up nicely. There are tons of stocks in the market that are in a daily uptrend. Best to find a stock that has a defined and smooth daily uptrend and then find breakouts and dips to play.